London Water Polo strives to provide water polo players of all ages an opportunity to learn, grow and develop in a positive, professional and fun atmosphere. Visit www.londonwaterpolo.ca for more information. The London Synchro Club (LSC) is thrilled to highlight a new Provincial 10&U team this competitive season. Interested in synchronized swimming? 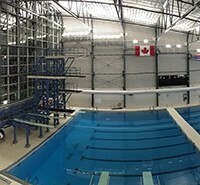 Visit www.londonsynchroclub.ca.